Toronto is a vibrant and cosmopolitan place. 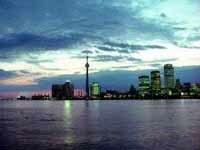 It is Canada's most heavily populated city and home to more than 80 ethnic groups. The city has a lively stock exchange, soaring architecture, museums, art galleries, performing arts companies, fine restaurants, large shopping complexes, and a striking natural beauty. Situated on the north shore of Lake Ontario, Toronto has distinctive neighbourhoods, where immigrants from across the globe have helped shape what it means to be Canadian. The city's most prominent feature is the CN Tower. The landmark is one of the world's tallest free-standing structures, and has design elements that help visitors enjoy the view. Chief among them are glass-fronted elevators and a revolving restaurant near the top. Toronto also boasts the Rogers Centre (formerly the Skydome). The multi-purpose entertainment complex has a retractable roof, and a claim to being the world's greatest entertainment centre. The city gets very cold during winter. Travellers should visit over the mid-year period if avoiding chillier weather is a priority.